Writing about a children’s book after it becomes a popular movie sometimes makes me feel like I’m one step behind. But the truth is, I’m not really up on movies, and don’t realize it’s been a movie until after I read and love the book. 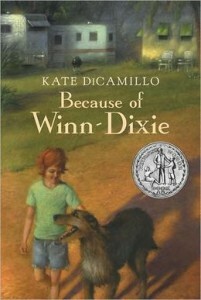 Such is the case with Because of Winn-Dixie. If your family has seen the movie, (and I haven’t,) perhaps this isn’t the book for your kids. But if they haven’t seen it, this is a little treasure. Part of what I love about this children’s book is the simplicity of the writing and the story line. That makes it perfect for early readers. Plus, there is so much goodness in this book, particularly in the way that a simple stray dog creates wonderful openings for friendship and kindness. Then there’s the character of Opal, who just goes ahead and makes the best of what might be a struggle- new town, no mom, a busy father. But her genuine openhearted way creates magic. Along the way, the book addresses the difficult issue of loss of one parent, and adjusting to change, in a very sound and realistic way. Finally, for any kids who love animals, and especially dogs, it’s hard not to fall in love with this children’s book. You can almost feel the dog putting his head on your lap, and making the world right again. This is a book of the heart. Great for kids up to about age 11.